When the weather turns cool and the days grow short, cranberry walnut pies creep out of Ann Arbor and make their way across America. 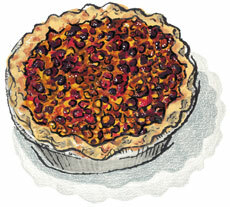 They’re one of our top-selling pies, lauded by Good Housekeeping magazine for a reason. Brown sugar custard, made with real butter, vanilla and Mauritian brown sugar, is mixed with a generous amount of toasted walnuts and tawny cranberries inside an all-butter crust. Nutty, sweet, rich and just a little tart, it’s as beautiful as it is addictive. Cradled in a re-useable embossed metal pie tin and nestled in our handsome wooden crate or cartoon cardboard box.